You must sit through this video! I have been to these places…sat in awe of the scale of it all. Even Cinque Terre is represented here…all of the huge squares, the water…the places I have been! Beautiful! Echoes of light that shine like stars after they’re gone. With the music up above. …but….everyone is so comfortable and relaxed that it ALL goes well! Caesar salad, Bill’s buckwheat pasta, acorn squash…beautiful black forest cake…and nice wines. Conversation and remembrances…special time in the studio…a very special evening! I’m excited that finally the last level of my four level split home is getting a renovation and that I will have easy access to a bathroom when all is said and done! There are so many things that will need to be done over time in terms of maintenance…a new roof, window replacement here and there….those sorts of things…but in the meantime, I’m feeling as though I’ve made this house a home! I’m excited! Today I will bunch up the last heap of stuff to be sorted. Last week I made multiple trips to the Women In Need Society, Value Village and the city dump. There are likely a couple more trips to go! Anyway, you can watch the progress of the work in the photo album here. Hoping that you are all NOT SO BUSY as I am…and putting your feet up on the coffee table for a bit of a weekend break. We’re getting a huge dump of big white flakes right now and the temperature is plummeting, so it’s just as well I am remaining inside today. I know that my photo is a tad disturbing…but truly, this is how I go around for a good portion of the time! This splint is to attempt to get the first knuckle to bend…and do note that the pinky no longer wants to do her job either! It makes for a real bummer when you try to take a lid off a jar! Anyway, one of my students took a hallway photograph and even though it is a wee bit fuzzy, it’s been ages since I’ve consistently posted photographs!!! Since dropping and breaking my digital camera sometime during this ‘hand’ project (at the digit shop), I’ve missed keeping an archive in images….but……guess what??? I’m going to buy a new camera this weekend!!! Yippee! Get ready for some visual updates of every sort. The student art work has been piling up for weeks….and I completed a landscape in my own studio over the past three weeks…new techniques and ways to manage things, but in the end, I’m tickled! Hoping you all have a beautiful weekend! Oh my gosh! 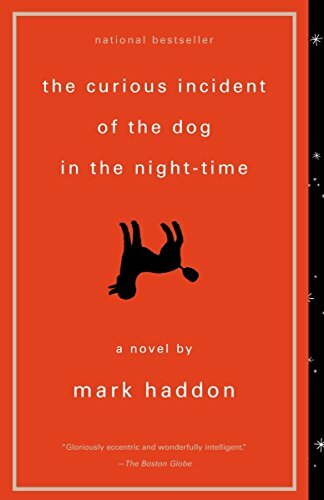 You HAVE to read this book by Mark Haddon! It is an excellent little piece of work…something that gives you an insight into the possible life of someone grappling with autism…through a variety of devices, Haddon takes us on a journey that we can not easily forget. I’ve included a link to a very well-written review done by Mary Whipple in 2003. The review certainly gives light to the subject, but read the book first! It was a wonderful thing to drive up the highway to Fairview, Alberta…to slip past Grande Prairie…take a day trip into Peace River and to stand above the Peace River at Dunvegan. The river was a dark turquoise-black, spotted by ice ghosts floating. Trees were crisp with snow and hoarfrost; a ‘magical’ sight! It was all so new to me and as I walked on my own in the town, snow shovelled up into banks three feet high to my left and right, I had fond memories of growing up in Ontario, Quebec and New Brunswick…crystalline white everywhere! My eyelashes froze and my nose started to run, but I arrived to the warmth and coziness of a welcoming home and had only happy feelings in my heart.